Angelicus Celtis from the ranks of the international broadcast and performance voices of Wales’ Hywel Girls’ Choir & Hywel Boy Singers will unite with the Hywel Choirs, Llanelli Choral Society and Haverfordwest Male Choir for an momentous massed voice performance of “A Journey of World Music” on Saturday 7 October at St. David’s Cathedral. The evening will also star acclaimed organist Huw Tregelles Williams OBE, pianist Jane Jewell, orchestral percussionist Gareth Hamlin – all under the baton of legendary conductor John Hywel Williams MBE. 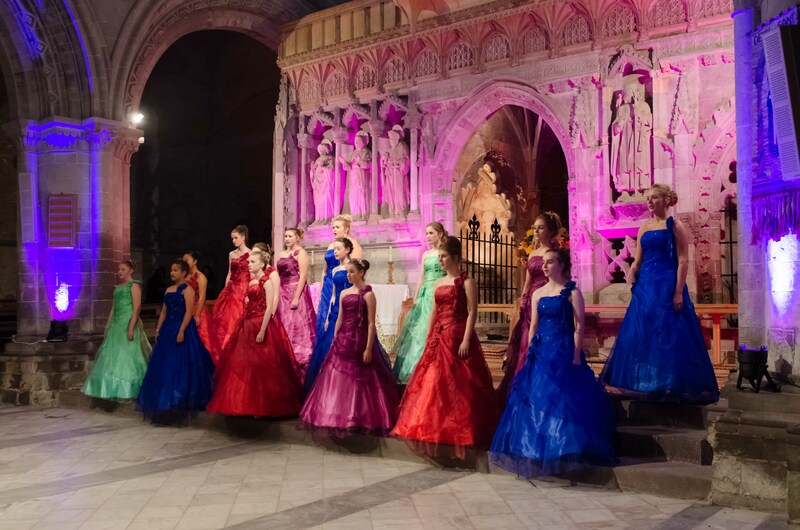 The artists and stunning performance return to the cathedral by popular demand after last year’s sell-out performance in October 2016. 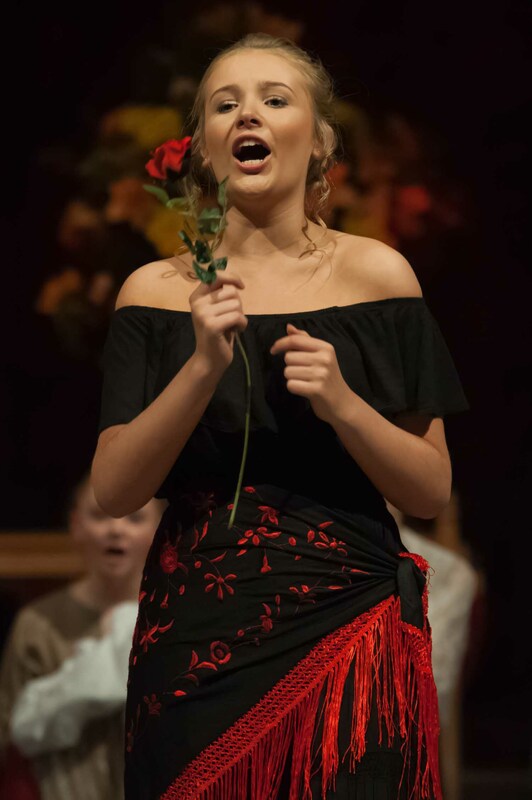 This year’s performance highlights will include magical moments from opera, classical, sacred, cinema, musicals and international music. Exciting highlight will include Habanera, Benedictus, Les Miserables, Phantom of the Opera, Nimrod, a poignant tribute to veterans and the centenary of WW1, Holy City, a world premiere of a choral arrangement of Karl Jenkins’ Palladio Allegretto by John Hywel & Jeremy Hywel and Angelicus Celtis’ acclaimed rendition of Nessun Dorma as seen by millions of TV viewers around the world… to name but a few. Angelicus Celtis who have enjoyed a whirlwind year of television and radio broadcasts, were recently featured on BBC’s Songs of Praise filmed from Pembrokeshire where they gave a moving rendition of Be Still My Soul from the beautiful surroundings of Manorbier Castle. 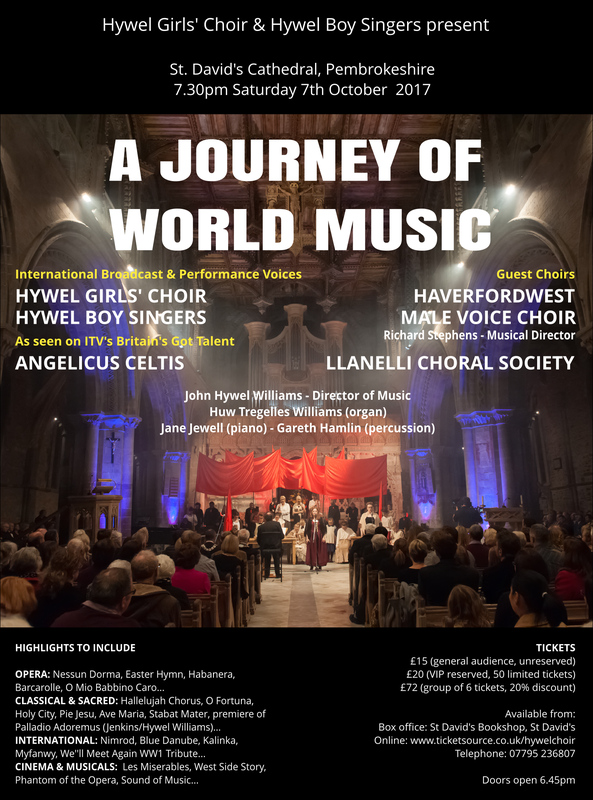 Tickets for A Journey of World Music (£15, £20) can be obtained via www.ticketsource.co.uk/hywelchoir, by telephone 07795 236807, at St. David’s Bookshop or at the door. Doors open 6.45pm. Performance commences 7.30pm.